A picture of some shop fronts on the Caledonian Road, a little to the north of Kings Cross station. 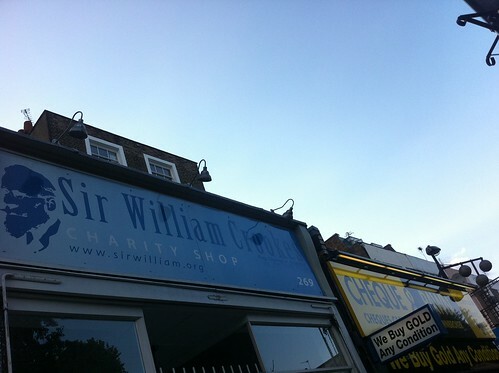 At the forefront is a slightly grubby blue sign: the Sir William Crookes charity shop. A lot of London charity shops are big brands like Oxfam or the British Heart Foundation, but there are a few independents like this too. They tend to be based around local charities though, named after a campaign or hospital, not a person. So, when I passed this shop one night on my way home from a party, it stuck out. I also recognised the name. Crookes, Crookes, where I have I heard that before? Sir William Crookes (b. 17 June 1832, London – d. 4 April 1919, London), a physical chemist who did fundamental work in the development of atomic physics. The eldest kid of sixteen, his father was a successful tailor with a shop in Regents Street. The DSB says he had irregular schooling, although Hannah Gay (BJHS, 1996) also stresses that for all that his interest in chemistry was self-motivated and unsupervised, he was not without support. At 16, he joined AW Hofmann‘s Royal College of Chemistry, ending up as Hofmann’s personal assistent for a few years in the early 1850s. Hoffman’s focus was organic chemistry, but inspired by Faraday, amongst others, Crookes turned his attention to chemistry’s interaction with physics. In 1854 he was briefly superintendent at Radcliffe Observatory in Oxford, and in 1855 moved to teach chemistry at College of Science in Chester. (At this point I like to imagine him as a teacher in a mid 19th century version of Hollyoaks, but maybe not). Crookes moved back to London in 1856 and set up a private laboratory in his home and started an entrepreneurial scientific career the DSB entry described as ‘catholic’. He was an ambitious man, both in business and science, a strong believer that pure science would lead of financial rewards. One might argue he had to be: he had ten kids to support. His work with vacuums is credited with making possible the discovery of the x-ray and the electron, and was apparently a bit annoyed not to have discovered the x-ray himself. In early March 1861, he found a bright green line in a spectroscopy he was running. He initially thought it was an impurity, but by the end of the month he was confident it was a newly discovered element, and called it Thallium, after the Greek for green shoot. In 1873, he invented what’s known as the Crookes radiometer; an airtight glass bulb, containing a partial vacuum and a set of vanes, mounted on a spindle, which rotate when exposed to light (you’d recognise one if you saw it). He was knighted in 1897, and held presidencies of the British Association for the Advancement of Science and the Royal Society. He founded Chemical News and was involved in several other publications. He published somewhere between 250-300 papers during his career, on a wide range of subjects. As the DSB puts it “with aid of his literary adviser, Alice Bird, Crookes acquired a well-deserved reputation as a Victorian sage”. (Oh, how much do I want to know more about the Bird lady? Also, do check out quite how much of a sage-like beard Crookes had). Ok, you’re probably wondering what the hell has this got to do with a charity shop on the Cally Rd? Did he do the Victorian philanthropist thing and found a hospice or library or something? Did he do load of work on radiation, so a cancer charity’s been named after him, like Marie Curie? Nope. Well, he did work on radioactivity in his later years, but that’s not it… The URL on the shop-front sign was down, but using the Wayback Machine I found content in English and Portuguese, connected to a spiritualist church. Yep, spiritualist church. Spiritualists, in the words of Wikipedia, are not to be confused with spirituality. It is a specific religion which has some roots in Christianity but dates from 1848. Try BBC’s spiritualism at a glance if you want a primer. The very short version is that they believe you can communicate with the dead. If you are WFT-ing that a chap who was a President of the Royal Society might have been into séances, you wouldn’t be the first. A contemporary of Crookes, WB Carpenter, the man DSB describes as Crookes ‘archenemy’ would talk of two Crookes, one a rational scientist the other a credulous spiritualist. That’s a very narrow view. Crookes was brought up with the Christian view of an afterlife. He also suffered the death of a beloved brother in 1867. More to the point, there was a range of kinetic, audible and luminous phenomena (and ideas) associated with a séance to capture his scientific attention. Let’s also remember that by the middle of the 19th century, the Victorians had seen huge social and scientific change, people like Crookes wanted to be open to extra-ordinary ideas, and in many ways a study of spiritualism offered a physically-based explanation of aspects of the world. It’s also worth stressing that he was deeply sceptical of much of it, and intolerant of obvious hoaxes, taking a meticulous empirical approach, even if (or perhaps because) he also believed that ‘real’ mediums who could talk to the dead existed. He submitted a paper to the Royal Society on the subject which was rejected on grounds it was not exciting enough (Crookes then published in his own Quarterly Journal of Science), and they did later publish negative observations of another medium. It’s probably worth mentioning that he was President of the Royal Society after all of this (1913-15). Although the DSB entry does dryly conclude with line that this presidency “was marred not only by the outbreak of war but also by a degree of ill feeling from the young generation of fellows that he had sowed the wild oats of genius past his allotted time” and Gay also notes that many of his awards from the scientific community seem to have been given grudgingly, that wasn’t necessarily because of his involvement spiritualism. Studying ghosts wasn’t quite the credibility-krypotonite it might be for a scientist today. Gay’s paper starts with the observation that it’s often asked why Crookes didn’t do more with his career, but that one could equally ask why did he accomplish so much? She argues that although he didn’t come from a ‘gentlemanly’ background, or an especially scientific one, his family were not without money or connections. Several members of his family had connections in bookselling, which helped him later in publishing work. He also built on early professional networks at the Royal College of Chemistry, which Gay refers to as a fraternal culture, based on communal if competitive laboratory work supplemented by many outdoor and evening activities. Later, although he had a private lab in some respects this was a “a family economy”. His wife helped, as did his mother in law and, when they were old enough, kids. There were also key roles played by a mentor (George Gabriel Stokes) and skilled laboratory assistent (Charles Henry Gimingham). Gay’s paper concludes with the important point that there is often an ‘underground economy’ in the production of scientific knowledge which we should always be aware of. She means this in terms of the construction of the conventional science and engineering; behind every great man of history there is not only likely the cliched great woman but a load of other support systems and networks it can be easy to miss (or even deliberately obscured in myth-making). A similar point could easily be made to understand the ‘two sides’ of Crookes. There is always a lot more to a scientific career than just the things that get written up in textbooks, and a lot more to the generation and development of scientific ideas than necessarily ends up lasting as ‘scientific’ thought. I still have no idea what Crookes’ would have made of his name being used for a shop-front charity in North London though (I mean, the dude was from West London…) or precisely what the money raised by that shop funds. This entry was posted in chemistry, historyofscience, scientists and tagged chemistry, history of science, psychical research, scientists on August 18, 2011 by alice. 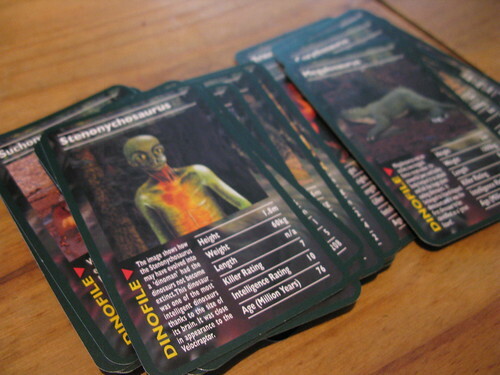 This is a picture of my small collection of science-themed Top Trumps. It’s one of those things you only remember you own when you are moving house (I have just packed up my possessions to store while I spend two months in North America*). 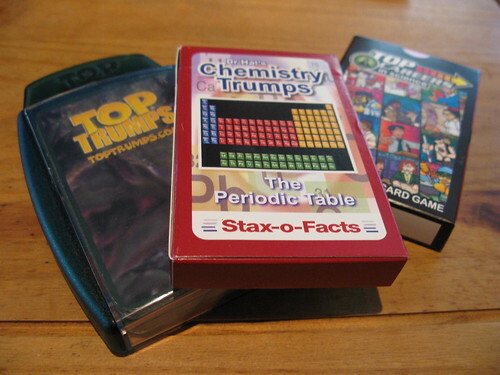 Top Trumps, if you haven’t heard of it, is a card game. Each set of cards is themed. In the picture above you can see chemistry, dinosaurs and scientific careers, but they’re more likely to be characters in a TV show, cars or footballers (yes, there is a Royal Wedding set…). Each card will have a set of values relating to that theme (e.g. height, weight). You play in rounds. Someone picks a category, and the player with the card with the highest value in that category wins the round. Popular in the 1970s and 80s in the UK, they were relaunched about ten years ago. As one might expect, there’s a detailed Wikipedia entry. Or there’s the official site, Planet Top Trumps. I’ve written about the dinosaur set before. As I said then, it reminded me a bit of Buckingham & Scanlon’s comparison the way dinosaurs are used in non-fiction publishing with Pokémon (it’s all about collecting and exchanging facts, with the odd semi-fantastic monster thrown in). 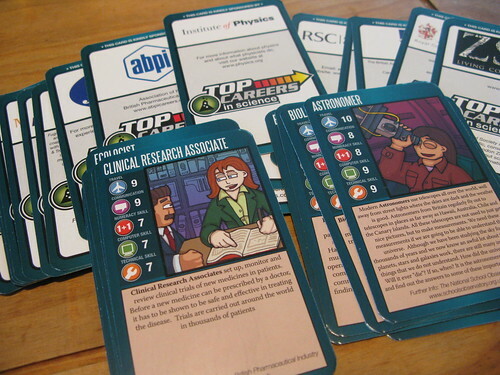 Each round of Top Trumps is very quick, but this doesn’t leave much time for considering the context of the values assigned, and we did query the scientific basis for some of these too. The ‘dinoman’ card is especially weird (I’m not the only person to have spotted this. There is a facebook appreciation page). That old post about these was passed around a few bits of the internet, and as a result I was sent a pack of Dr Hal’s Chemistry Top Trumps. The ‘values’ here are atomic weight, danger factor, usefulness factor, melting point and year of discovery. Each card comes with a picture and a few sentences of ‘elementary facts’. I played this with some friends recently, and like the dinosaurs set, we wondered why we had to assume the biggest number is best, and there was some debate over whether it should be the biggest amount from 0 (either 0 degrees for temperature, of 0 years before common era in terms of discovery date) that won. Still, even our grumbles were, arguably, forms of learning about chemistry, and I do think I gained some feel for the elements as we sifted through them in the course of the game. 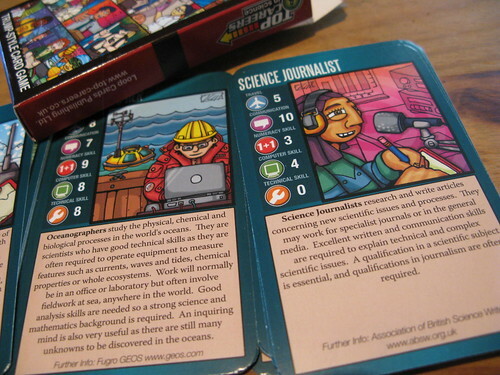 About a year ago I picked up a set of science career trumps card at the Science Museum shop. As a procrastination from packing I was reflecting on the chemistry pack anyway, I had a bit of a shuffle and a read. Each card is carries the logo of an organsation connected to the job, and along with the values (travel, communication , numeracy, computer and technical) there are illustrations and a blurb. Here’s a picture of a few more. I was a bit surprised that the Association of British Science Writers say a qualification in a scientific subject is essential for a career in science journalism (I’m a member of the ABSW. I don’t have any scientific qualifications). Playing the careers one, I really felt this was a blunt way of learning. I could see how the processes of the game could help bring some familiarity with the materials (and, as with the chemical elements, reminded me of ones I forgot I knew about), and I could imagine kids going ‘I want to be a…’ or ‘ha, I wouldn’t be a…’ off the back of one card ‘trumping’ another. Still, for me, it’s no substitute for something like the I’m A Scientist project, which connects young people to professional scientists. I’m not sure we should play games with careers. Maybe I’m being oversensitive. 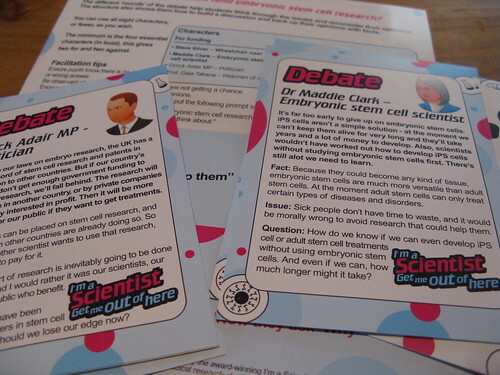 I should probably note that the I’m a Scientist team do also produce debate packs structured through cards as another thread of their work. These aren’t Top Trumps though, they aren’t so competitive and don’t try to assign these odd numerical values to everything. The aim of the card-playing aspect of these packs is to prompt and help structure discussion (it’s worth looking up Democs if you are interested), which I suspect is the key way people learn from the chemistry or careers sets too. 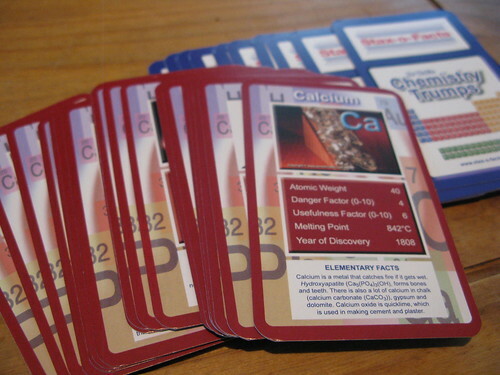 I’d be interested to know if any science teachers have used Top Trumps though, and what the students thought. * I’ll be in the USA and Canada from the 18th of April. I’m mainly going to be in DC (at American University, School of Communication) but with some time in New York, Philadelphia, Chicago, Toronto and Ottawa while I’m in that part of the world. This entry was posted in chemistry, children, consumerproducts, education, engagement, toys and tagged chemistry, children, consumer products, education, engagement, toys on April 18, 2011 by alice. 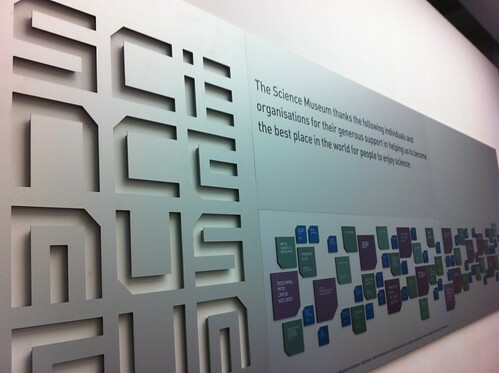 This is a picture of a large plaque at the front of London’s Science Museum. It’s thanking their various sponsors. Most museums have them. It’s as normal as a gift shop and a cafe. I photographed it because I wanted to think of such signs not just as a vote of thanks, or as the design piece this museum seems to want to re-articulate theirs as, but as a sort of declaration of conflict of interest. In many respects, I think’s what it is. I also think this is why we should be pleased the museum has tried to make theirs into an arresting aesthetic object. Museum sponsorship has a long and often controversial history. I wrote about it last year with respect to Shell and the Science Museum’s climate science gallery (see also follow up post on similar controversies at the Smithsonian). Today on the Guardian’s culture cuts blog, Tony Hill, Director of Manchester’s Museum of Science and Industry has a post reflecting on the impact to his institution. He notes that retail, catering and conferencing will become ever more important, as will sponsorship. They also hope to increase the average donation per visitor from the current 3.5p per head to 50p. I’ve noticed that the London Science Museum, as well giving its wall of thanks a polish, has filled its entrance hall with a load of ‘keep science free’ signs asking for donations. I think it’s interesting that the Science Museum are playing on the rhetoric of keep Science free. Not the Science Museum, or scientific heritage, or scientific education, or buttons that are cool to press. You could almost hear the collective sigh of relief from UK science after the government’s autumn 2010 spending review. Indeed, it was a largely grateful audience that met science minister David Willetts when, in the week after the spending review, he joined a panel for a ‘Science question time’ event at the Royal Institution (RI) in London. Sceptical, as scientists are wont to be, but relieved that cuts were not nearly as deep as expected, nor as deep as they will fall elsewhere. Near the end of the evening however, a hand went up from the back of the Faraday Theatre. Writer and astronomer Colin Stuart asked: what about other cuts to other areas, museums for example, how will those affect UK science? Stuart has a crucial point here: we should be careful of applying too narrow a definition of science funding. Questions about where money might (or might not) come from concern people in lots of different areas involved in the sharing of science with broader society, not just museums. In book-publishing and journalism as much as publicly funded work. Sponsorship is an option for some, it’s also getting harder to find (it’s not like print journalism are riding high on advertising revenue right now). Increasingly, academics are asked to do communications work as part of their day-to-day work as a researcher. I think there are good reasons for asking researchers to do this, but I also think we need to give academics time and support to do such work. Time and support that costs money. I also think that we shouldn’t force all academics to do public communication, and there is a role for professionals here too, but that’s a whole other (and frankly, slightly tedious) discussion, probably best left for a bit of ranting in the pub. This entry was posted in chemistry, museums, policy, publication and tagged chemistry, museums, policy, publication on January 26, 2011 by alice. When did forensics become entertainment? Moreover, when did it become so domesticated it could be packaged into a childrens’ toy? It’s about death and crime. The slide of this toy was met with several laughs at the conference. For me, however, it was the lack of humour embodied by the product itself which interested me. It reminded me a bit of The Planet Science Whodunit, a forensic education event for teenagers I worked on back in 2003. The premise was that someone had stolen a guitar from boy-band Busted. Schoolchildren could sign up for kits to do some forensics-inspired activities to “solve” the crime. There were prizes; we had a panel of celebrity suspects; it was all played for fun. Although in many respects this project was inspired by CSI, we were careful to limit any references to traumatic crime. It was lighthearted. Indeed, one of the criticisms that could be leveled at this project was that it trivalised issues surrounding crime. Another comparison with the CSI toy is the style applied by Horrible Science (major UK brand of science books for 7-11’s, I did my PhD on them). 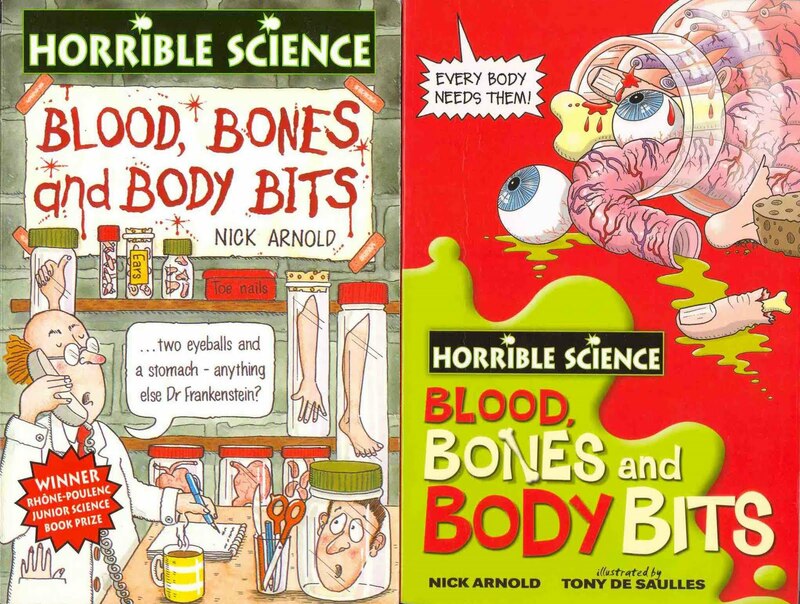 Perhaps the best example of their approach to blood and guts is the covers of Blood, Bones and Body Bits (1995, and 2008). Here, Horrible Science wraps its dismembered bodies, blood and viscera in a comic book form. It’s ok somehow because it’s “just for fun”. Blood and guts take center stage here, but in a very comic way. It knows “those eyes, man! Those EYES!” are following you, it camps it up deliberately. It doesn’t take itself seriously and doesn’t expect you to either. It’s childish and Bugs-Bunny like, it’s surreal and so slightly unreal through it’s comic qualities. This is an example of what I described in my thesis as Horrible Science’s “ironic bloodthirsty pose”, something you can see applied across the series, to lesser and greater degrees than in the Horrible Histories, depending on topic. It is one of the many ways in which the series are “Science as Pantomime” (title I gave my thesis). I took “ironic bloodthirsty pose” from David Buckingham’s great book on children and television, where he listens to children explain what they like about watching horror. One of the points Buckingham makes from these conversations is the appeal of a sense of adulthood in watching horror. For all their slightly childish joking, in some respects what the young people relished was the seriousness of it all, it helped them create distance from an idea of a trivial silly little kid. I remember feeling that the Whodunit idea was a bit more grownup than other Planet Science projects I’d worked on, the allusions to forensics were a key part of that, even framed as a joke. You can find some more discussion of such ambivalences in Martin Barker’s excellent history of a campaign in 1960s Britain against horror comics. I’ve blogged on this before: why the Horrible books might be illegal. As I mention there, Horrible Histories author Terry Deary has argued that his approach wouldn’t have been possible if Roald Dahl hadn’t already brought about an acceptability of the grotesque in British children’s literature. Or, for slightly different analysis, Jane Kenway and Elizabeth Bullen, in their book Consuming Childhood, also talk about the way contemporary children’s media tries to make children “aspirational”, to want to act more grownup, as a sort of marketing strategy (see also this and this on such late 20th century shifts in style of address in children’s media). So, considered from the perspective of the comic-gore of Horrible Science, the CSI facial reconstruction kit seems odd that it doesn’t frame itself in humour jokes (though we may laugh at it). Maybe, conversely, the seriousness allows for the gruesome-ness in a US context, where edu-tainment media tends not to have comic-gore and irreverence of Britain’s Horrible books? A rather straightforward example of forensic science lending a form of legitimacy, even in kids’ media? That said, it looks as if the company who make these toys has gone bust, so maybe everyone had the WTF reaction of the “those eyes, man! Those EYES!” comment on Amazon. This entry was posted in anatomy, chemistry, children, comics, consumerproducts, toys and tagged anatomy, chemistry, children, comics, consumer products, toys on June 14, 2010 by alice. In case anyone thinks the pink construction set (with sparkles) is a new thing: a chemistry set for girls, 1958 (USA). Or rather, a kit for a wannabe “Lab Technician”, because the girl would be just supporting the actual chemist, naturally. Apparently it included a pink microscope. Mother and daughter look terribly happy though, don’t they? Apologies for bad quality photograph, it’s of a powerpoint slide. From an event on 20th century popular science I ran yesterday (full blogpost on this forthcoming). The paper was given by Maggie Jack, a History and Philosophy of Science MPhil student at the University of Cambridge, based on the dissertation she wrote as an undergrad at Harvard. Early/ mid 20th century chemistry sets were marketed quite explicitly for boys and their fathers, as if chemical experimentation was an opportunity for male bonding and general expression of red-blooded manhood. Fear not the explosions, take power over nature, etc, etc. Insert your favourite feminist philosopher of science here. It really wasn’t anything subtle: the box covers and advertising for chemistry sets seemed to want to signal BOY, and do so as unequivocally as possible. This isn’t just an American trend, Salim Al-Gailani (another HPS Cambridge student) gave a similar paper about UK chemistry sets at the 2007 British Society for the History of Science. It’d be interesting to know if the same was true in non-English speaking countries too. 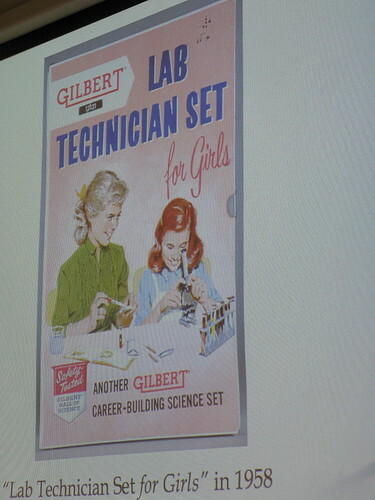 I’m sure 1950s girls played with the non-pink chemistry sets, however they happened to be presented. Just as girls read Harry Potter, even if his name is bigger than J(oanne)K Rowling. It probably goes without saying that when it comes down to their actual use, gender messages of kids media aren’t nearly as simple. In fact, one of the key points Jack wanted to make about Chemistry sets was the way they provided materials for exploratory work; that they allowed play through unintended consequences of science (indeed, they celebrated this), rather than necessarily being a matter of leading kids through a set of pre-ordained educational outcomes. I’m a bit too cynical to necessarily agree with her entirely on this, but it was a worthwhile point. Plus, my expertise on the topic is rather skewed to late 20th/ early 21st century kits: maybe such toys were a lot more exploratory in the past (even if gender identities were not?). Finally, before we dismiss the pink microscope/ lab technician kit as a funny old 1950s thing, here’s an fword post about chemistry kits, written just last year, which brings out some of the gender issues involved in our recent fashion for retro kids’ non-fiction (*cough* Dangerous Book for Boys *cough*). EDIT (15:10): from tip-off via twitter, a pink telescope with a lower power than the boy’s model (worth scrolling through the comments on that post). EDIT (15:25, 2nd April): from various comments I’m getting about this, I just want to underline that I can see how a pink microscope might be seen as something quite empowering, a positive expression of feminine science (now as much as in 1958). Personally, I’m not convinced by this argument, but I don’t think we should simply say pink stinks and that’s the end of the debate. Gender issues are always complex, in toys and in science perhaps no less so. This entry was posted in chemistry, education, events, science, toys on April 1, 2010 by alice.